Hurricane Sandy and the nor’easter that passed through over the past few days blew an assortment of leaves, pine needles, branches and more to the ground. The 65 mile an hour winds took down some trees and changed our landscape from colorful fall to bare branch winter. Walking around Poison Ivy Acres and driving in the area I can’t help but notice how the ground is strewn with what used to be held above. “Leaf litter” we call it. Last summer’s foliage is now scattered over the ground. It covers the driveway and blows into the garage when the doors are opened. For many this organic abundance is a nuisance. It needs to be raked, blown, and hauled away. 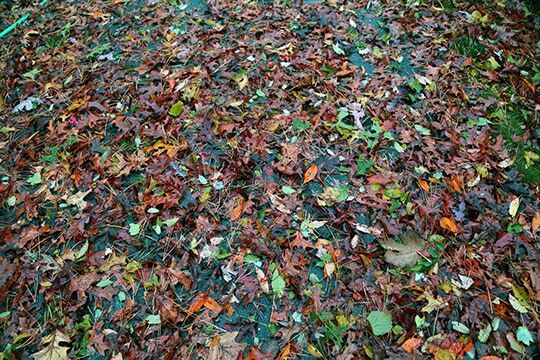 One definition of the word “litter” is “to be scattered over place.” This is an accurate definition of what happens with the foliage from our deciduous plants in the fall. Unfortunately other definitions of the term usually prevail: “scattered trash,” and “messy state or place.” In this age of no littering signs and litterbugs, we don’t think kindly of this debris. Never mind that these leaves, needles, and twigs are bounty from above. What most people see as waste, gardeners know is gold for the garden. Composted leaves are higher in mineral content than any manure. They are the soil amendments and fertilizer that have kept plants growing since florae first appeared on earth. And no, oak leaves and pine needles do not make soil acidic. Plants have developed a way to nurture themselves. Life litter might be a better term for this organic matter that falls to the ground. These thoughts propel me into Whole Life Gardening mode and I start to consider how this is connected to other aspects of our lives. Perhaps the things we choose to shed, those habits and aspects of our personality that we are willing to walk away from, serve to foster our growth once they’re discarded. Is it possible that being willing to let something go turns it into life litter that will nourish our future growth? After hurrican Sandy the street, drive and lawn were coated. The Dog takes great pleasure in rolling in life litter. Dogs know that shedding is a good thing.